Rules of Golf: Which ball is in the bunker? Here’s an interesting photo that I came across on a Leith Society Discussion board. My thanks go to Bernard, and his friend who owns it, for their permission to use it here. Assuming that there is no Local Rule declaring the steps to be integral to the course, which ball(s) do you think is/are in the bunker? This one is a little controversial and illustrates why it is so important to consider introducing Local Rules to avoid confusion. As it stands, only ball ‘C’ is in the bunker because it lies within an imaginary line drawn between the bases of the grass banks on either side of the steps, which defines the margin of bunker. 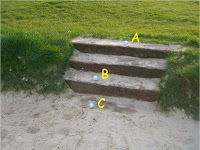 However, it can be argued that if the steps had been swept of sand and there was any lip down into the sand from the bottom step, then the margin of the bunker would be around the base of the bottom step. So, if we assume that ball ‘C’ is in the bunker, how does the player proceed? Rule 24-2b deals with relief from an immovable obstruction in a bunker. (a) Without penalty, within one club-length of and not nearer the hole than the nearest point of relief in the bunker. When the ball is dropped within one club-length of the nearest point of relief in the bunker it must first strike the ground in the bunker at a point that avoids interference by the immovable obstruction. The player must lift the ball and drop it, without penalty, within one club-length of and not nearer the hole than the nearest point of relief. The nearest point of relief must not be in the bunker or on a putting green. When the ball is dropped within one club-length of the nearest point of relief, the ball must first strike a part of the course at a spot that avoids interference by the immovable obstruction and is not in the bunker and not on a putting green. If the Committee had introduced a Local Rule saying that the steps were an integral part of the course no relief without penalty would be available and the ball must either be played as it lies, or declared unplayable under Rule 28 with a penalty of one stroke.